ENTREPRENEUR, GRAVIKY LABS, Forbes 30 under 30, Chronic Inventor,Anirudh’s love for using technology to inspire wonder has taken him to MIT Media Lab, where he invents across disciplines. Currently, he's working on a printer that harvests ink from pollution at Graviky Labs. He also dabbles in magic, herpetology, motorcycles, and plays the tabla. ​Anirudh is a Masters student and Research Assistant at the Fluid Interfaces Group. His interests lie in the area technologies for social impact, displays, projected interfaces, mixed reality, wearable computing, assistive technologies and open-source. Before going to MIT, Anirudh Sharma started the LeChal shoe project- haptic shoes for the blind mobility which got the MIT Tech Review TR35 ‘Innovator of the Year’ award. His venture Ducere manufactures the electronic shoe insoles for the visually impaired, featured on Techcrunch, BBC, WIRED as one the 10 most innovative wearable startups. Presently, Anirudh is working to spread the movement of anti-disciplinary learning, hands-on creation and design thinking all across India through the MIT Media Lab India Initiative. ​He leads the Design Innovation Workshop Series to provide platform for diverse communities including designers, artists, engineers, scientists and many more to come together and innovate, creating entrepreneurs and exploring social impact in the developing world. His work has been showcased at UIST, CHI, Aspen Ideas Festival and other HCI venues. 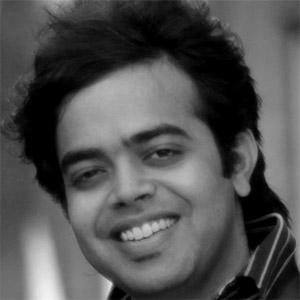 ​Anirudh Sharma always found conventional education boring. After finishing school, he set up a small animation studio on the pretext of preparing for the entrance exams to engineering colleges. Two years later, he even enrolled with an engineering college in Rajasthan, but found himself building award-winning large interactive displays instead of studying.